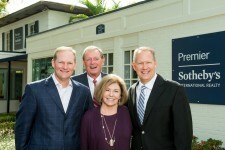 Premier Sotheby’s International Realty announced today that the award-winning sales team Night-Pinel & Co., comprised of Mick Night and John Pinel, has joined its Winter Park office, located at 233 West Park Avenue. With more than 40 years of combined real estate experience, Night and Pinel consistently rank among the top-performing sales teams in Florida and were rated the number one small team in North America for 2017 by their former company. Mick has been the number one Winter Park/Maitland agent in annual sales volume for the vast majority of his career, dating back to 1988. Named Orlando Business Journal’s 2017 and 2018 Agents of the Year, they have achieved over $1.5 billion in career sales volume — including $181 million in 2017. Veteran luxury residential experts, the team will soon be announcing several new waterfront listings, including a $7.9 million Winter Park lakefront estate that has never been on the market. Headquartered in Naples, Florida, Premier Sotheby’s International Realty has over 1,100 associates and employees in 40 locations throughout Florida and North Carolina. Premier Sotheby’s International Realty also benefits from an association with the storied Sotheby’s auction house, established in 1744. For more information, click here.